With four floors stuffed to the brim with books, John K. King Used & Rare Books is a book lover’s paradise. This store is said to have over literally a million books in stock, and that wouldn’t be surprising given the size of the store. John King Books occupies an old glove factory building, and utilizes all of the four floors, with each one packed with shelves and aisles of books upon books upon books. John King Books is a general used bookstore, selling genres that range from “Alternative Medicine” to “Sewing & Textiles” to “Literary Criticism” to the usual fiction, nonfiction, and poetry. The rare books mentioned in the store’s full name are housed in a separate building from the main store, and is only opened to customers by appointment. But this store is more than just books, it’s also about collections. The store also sells antiques, art, collectibles, and prints. James Clifford writes in “On Collecting Art and Culture” that “identity is a kind of wealth (of objects, knowledge, memories, experience)” (218), and John King Books has gathered together a multitude of identities in the forms of their possessions, ready to be passed on to a new owner and a new identity. This video provides a simple look at what the shelves of one floor of John King Books looks like. Before you even enter the store proper, in the lobby there are carts and boxes of books that are absolutely free for the taking if you’re willing to dig through them. The front counter is just inside the entrance, ready to answer questions and help customers as soon as they enter the store. The first floor boasts some of the more popular genres, including juvenile literature, Civil War history, poetry, and the classics, as well as some music and art stock. Customers must venture up the stairs and to the higher floors to get the full experience that is John K. King Used & Rare Books, however. The third floor, in particular, is a synecdochic embodiment of the bookstore’s literary offerings. It features both fiction and nonfiction, standard and unusual genres. Like the second and fourth floors, the third floor is organized simply in a modular manner, like a library. Hover over the graphic below to see red markers – hover over those for a sneak peek at that spot on the floor. The stairs dump customers out into shelves of fiction from authors with last names B-Z, on the other side of which are hardcover mysteries. Those searching for authors A-B must go a little further into the floor. Fiction sections, highlighted purple, dominate this half of the floor, while the other half and the walls are occupied by non-fiction literature, highlighted green. All of the floors feature a mix of fiction and non-fiction, but none of them are so clearly divided as the third floor. John King chooses to place a majority of his fiction stock not on the first floor, not even on the second floor, but here on the third floor. As probably one of the most sought-out genres by customers, placing the fiction books on the third floor guarantees at least a small journey through the world of this bookstore. But its position right next to the stairwell means customers still won’t have to go far for their fiction fix. On the other side of the floor, an almost equally as large section of nonfiction awaits perusal. While the non-fiction on the second floor may indicate the STEM focus of today’s society (e.g. architecture, engineering, math, biology), the non-fiction genres here on the third floor appeal to hobbies, featuring gardening and sewing as well as automotive and nautical. Here is also where patrons will find the exclusive biographies sections, another genre that appeals to a wide range of people, although biographies may also be sprinkled throughout other sections like history and film. Something interesting to see is the location of the science fiction and fantasy genres, definitely one of the most popular genres. Like the general fiction, they’re placed up on the third floor, but their shelves are located over in the non-fiction side of the floor. Hardcover sci-fi and fantasy is smack dab in the middle of it between gardening and automotive! It’s a rather nonsensical placement and promotes the sense of organized chaos found in a store of John King Books’s size. It’s a little amusing to see this tiny sliver of space reserved for westerns between the stairwell and the non-fiction paperbacks. It’s a dying genre, but it’s still hanging on at John King Books. To find westerns on the same floor as literary criticism and self-help and picture books testifies to the diversity at this bookstore, as well as our society. Here you can find those books “on the pencil, the zipper, the toilet, the banana, the chair, the potato, the bowler hat,” or whatever else strikes your fancy (Brown 2). As the culture of things has grown in the past decades, so has the quantity of literature on those things, and John King Books is happy to carry all of it. Another defining characteristic of John King Books is the atmosphere created by the building and the shelving and other non-literary objects. 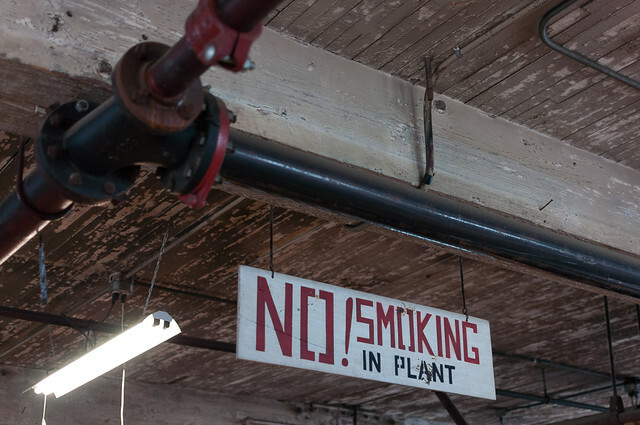 The sheer size of the space, exposed brick walls, fluorescent lighting, and old signage preserve the building’s history as a factory and create an industrial air that helps the store fit in at its West Side Industrial location. The huge volume of inventory is reminiscent of a library, and the hodgepodge shelving and handmade section labels lend the space some personal charm. Independent bookstores are usually characterized by “smallness (even though the independents count among their members some of the largest bookstores in the country), being locally based, and limited in geographic scope” and John King Books mostly fits the bill, although it falls into that parenthetical category (Miller 165). The combination of factory, library, and personal touches creates a nostalgic mood that shows that even though it’s bigger than some chain booksellers, John K. King Used & Rare Books is a unique independent bookstore. Clifford, James. The Predicament of Culture: Twentieth-century Ethnography, Literature, and Art. Cambridge, Mass: Harvard University Press, 1988.